Don’t think soup is just for the winter. 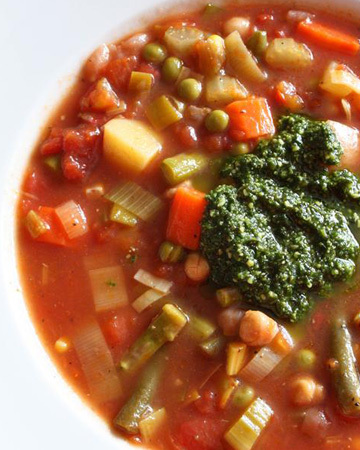 This fresh vegetable packed soup recipe will help keep you warm through the cool spring nights. The warmth of spring brings many fresh and sweet vegetables. What better way to use these delicious vegetables than by making soup. Not only does this soup recipe taste amazing, but it will help keep you warm throughout the cool spring nights. In a soup pot, add a drizzle of olive oil and sweat leeks and garlic together over medium heat. Be careful not to burn the garlic or it will get bitter. Add carrots, celery and red potatoes and cook for a few minutes. Add chopped tomatoes, stock, thyme, bay leaves and remaining vegetables. Cook on medium until the vegetables are tender. Serve with fresh basil pesto on top. In a food processor, add basil, garlic and nuts (if you are using) and pulse until coarsely combined. While food processor is running slowly, add in olive oil until desired consistency is met.